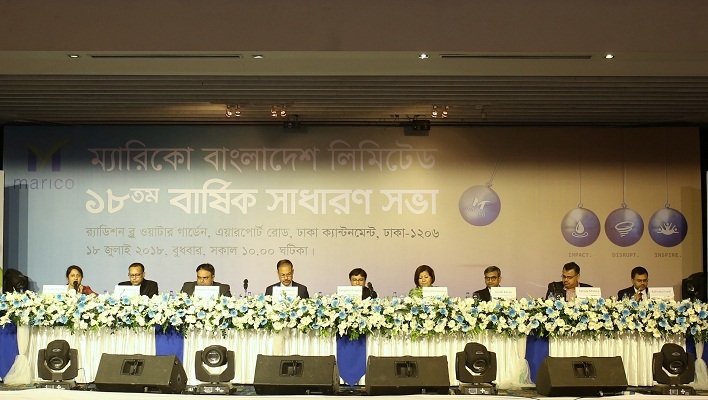 Marico Bangladesh Limited (MBL) has approved a final cash dividend of 100 percent (equivalent to Tk. 10 per share) in its 18th Annual General Meeting (AGM) on Wednesday. The AGM was organized at Hotel Radisson Blu Water Garden in the capital and Saugata Gupta, Chairman of the Board of Directors of Marico Bangladesh Limited, presided over the meeting. The confirmed dividend was preceded by an interim cash dividend of 500 percent (equivalent to Tk. 50 per share) declared and paid by the Company for the first three quarters of the financial year – bringing the total cash dividend to 600 percent (equivalent to Tk. 60 per share) for the year ended March 31, 2018. Speaking about the performance of the Company, Saugata Gupta said that the Company’s net profit after tax stood at BDT 164 crores with a topline of BDT 781 crores. Consequently, the earnings per share (EPS) stood at BDT 52.15. Saugata Gupta also updated the shareholders that in the last financial year, the Company has contributed BDT 228 crores to the National Exchequer in taxes, VAT and duties. During the year, the Company continued its CSR initiatives in collaboration with Dhaka Ahsania Mission (DAM) to provide free, quality education to more than 3,000 underprivileged children in Jamalpur Upazila through running a community inclusive program by building 75 CLCs (Children Learning Centres), he added. He further mentioned that they have identified sustainability focus areas across the business with a particular emphasis on energy consumption and water management. In the last year, they have reduced overall energy consumption by 3.1%, reduced consumption of fossil fuel by 9.9% and reduced water consumption by 1285 kilolitres at their manufacturing units. Among others, Naveen Pandey, Managing Director of Marico Bangladesh, along with the members of the Board of Directors, Independent Directors Rokia Afzal Rahman, Masud Khan (Chair of the Audit Committee) Ashraful Hadi and Directors Sanjay Mishra, and Vivek Karve and other management officials of the Company attended the meeting. A large number of shareholders also attended the meeting wherein all proposed agenda were unanimously passed as per Notice.